The BL-A9 L-Bracket for Sony Alpha a9, a7R III, and a7 III from Kirk Enterprises is a one-piece design that is custom fit for the camera. With its Arca-type compatible dovetail, it enables the camera to mount in a vertical or horizontal position when shooting together with a tripod and compatible head. 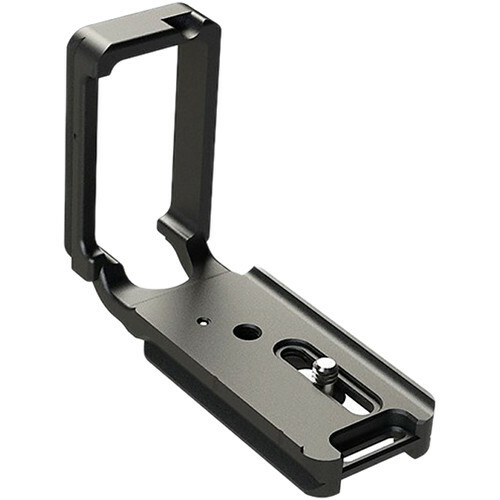 The black anodized 6061-T6 aluminum L-bracket, has a slotted design for side port access. At the same time, the bracket does not block the LCD monitor from tilting, provides access to the battery door, and has a hand strap loop machined on the right-hand side. The included 5/32" short hex wrench is used to tighten the L-bracket to the body. When it is not in use, it stores inside the bottom of the L-bracket's base. Furthermore, a 1/4"-20 mounting hole is located on the bottom and sensor centering lines are on the back, so the camera can be aligned on a tripod head. Box Dimensions (LxWxH) 4.6 x 3.7 x 1.6"
BL-A9 L-Bracket for Sony Alpha a9, a7R III, and a7 III is rated 4.9 out of 5 by 9. Rated 5 out of 5 by Michael B. from Great Product! Better option than RRS at this moment Awesome item. I echo the comments from previous reviewers. Single, solid piece without having to remove the camera's battery door, unlike the RRS bracket. One can completely access all the camera's side ports. Additionally, the extra screw attachment point at the base of the bracket adds the flexibility for additional component compatibility. I've added a Peak Design Arca Plate to the bottom of the bracket to allow me to use it with the Peak Design Capture. I can still use the vertical orientation as well without having to adjust the tripod orientation in any way. Highly recommended. Rated 5 out of 5 by Wee Chong from One bracket for all occasions Just received this L-bracket and is happy that it can be mounted on both right and left sides of the A9 camera body alone and with the vertical battery grip. The Anodized Aluminum is of good quality and very secure on my Gitzo Series 2 tripod ball head. You do not need to purchase and carry separate brackets if you plan to use the camera body with or without vertical grip attachment. There is a Allen wrench stored under the bracket base and a spare wrench included. Value for money. Rated 5 out of 5 by AC Lomie from Made in America! Its about time. This is super light and fits snugly on my new Sony A7R3. It does not obstruct the battery door so you can replace the battery easily. The L shaped Allen key is handily secured on one outside corner which is easily accessible unlike the RRS (Really Right Stuff) L Bracket that obstructs the battery door and the only recourse is to unscrew the L bracket. Unfortunately, the supplied Allen key in RRS version is absurdly attached to the inside corner and ?therefore inaccessible.? I recommend this 100%. Rated 5 out of 5 by Xiao-Sheng from Simple, solid and lightweight. Simple, solid, one-piece design, which, unlike the RRS version, doesn't cover the battery door or require you to move the door. It's also two ounces lighter. Fits perfectly into RRS lever clamps (and almost any sort of screw clamp). Rated 5 out of 5 by Alexander from Perfect L-Bracket for my Sony A7R III I've been always a fan of the RRS brackets but after checking the bracket for the a7r iii i didn't like the way it was designed where the battery cap has to be removed from the camera and install in the bracket. I found that this one from Kirk works for me since the bottom of the bracket doesn't reach the battery compartment. Rated 4 out of 5 by Colin from Fantastic Option Its sturdy and does exactly what its supposed to do. I also have the RRS L-Bracket and like both designs. This one is a little lighter weight and simpler in design but is equally as stable. I wish they would have a QD mount on the bottom like RRS does on theirs; that would have earned it 5 stars for me. Rated 5 out of 5 by Daniel from Perfect fit! Perfect fit on my A7R iii. No slop or slippage, love the offset female threads on the bottom for a sling mount. I can leave the sling mount in place with plenty of room to mount my camera on a tripod for landscape shots without removal. Rated 5 out of 5 by Carrie from I love it I have tried the sunwayfoto but I still prefer Kirk. First time I ordered with bhphotovideo.com and I love how fast their shipment was. I will definitely order from this company again . Will this work with an RX10 IV? Will this item fit the Sony A7R III fitted with a vertical grip? This would be for the A7R III body without a vertical grip attached. A more suitable bracket is the Really Right Stuff L-Plate Set for VG-C3EM Vertical Grip for Sony Alpha a7R III and a9 B&amp;H # REBVGC3EMLPL. Will this fit the A7RIII ? Yes this Kirk BL-A9 L-Bracket for Sony Alpha a9 and a7R III is compatible with the Sony a7R III. Will this fit the Sony A7iii? Yes, this Kirk L-bracket fits the Sony A7 III. Can you open the battery door with the plate on? Does the plate lip interfere with the LA-EA3 a-mount lens adapter? I'm assuming this L plate does not cover the whole base of A9? so it does not serve/help hand gripping on right hand? It does not cover the battery compartment. The L-clamp can also be positioned so there is space between the left side of the camera body and the clamp, to provide access to the ports on the left side of the camera while the camera is in the portrait position on an arca swiss clamp device. Do you need the LBA-1 spacer in order to use the Sony remote in Portrait orientation? Nope--works great in both orientations right out of the box.